If someone in your family has a mental illness, you are not alone. Members of NAMI Michigan have learned the hard way about mental illness and services available. We have compiled a great deal of information into a free resource guide that would have been useful to us at the beginning or our journey, in the hope that it will be helpful to others as they find ways to understand and cope with mental illness in their families. 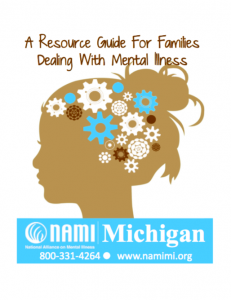 We welcome you to download your own copy of the NAMI Family Resource Guide here!